The Brazil French Press coffeemaker, designed in the early 80’s, was our first coffeemaker and quickly became a symbol of what Bodum stands for. Attractive and functional design at an affordable price. The Brazil has a durable, heat-resistant borosilicate glass beaker and a plastic handle and base, which make the Brazil easy to use and easy to clean. The 3-part stainless steel plunger has a fine mesh filter, which allows for a premium extraction of your coffee’s aromatic oils and subtle flavors. A mesh filter allows this flavor to be delivered direct to your cup and not absorbed by a paper filter. Plus, no paper filter means no waste. The patented safety lid prevents the splashing of liquids while pressing. All parts are dishwasher-safe. 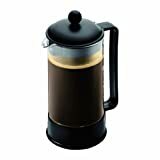 This was my first French press. I have always enjoyed this type of coffee, particular after dinner. However, I was attracted to the plastic framework surrounding the carafe, as I can be clumsy at times. This press has worked just as well as the more expensive, more traditional looking French press pots. I set the coarsest setting on my Braun grinder, and no grounds get through the screen. It is just perfect. I haven’t ever run my press through the dishwasher, it isn’t necessary with the easy cleaning with this one. I just put hot soapy water in the carafe, up-and-down a few times with the plunger and it’s all ready to use again. I have heeded the warning not to stir with a metal implement; I use a wooden spoon. I would heartily recommend this model of Bodum for someone who would like to experience French press coffee at home, inexpensively. I have two Chambord models, and this one. I prefer the features of the Brazil’s keyed lid, and secured plastic frame to the Chambord models. I’ve had this for about 3 years now, use it every day, and it’s held up perfectly. Great press.